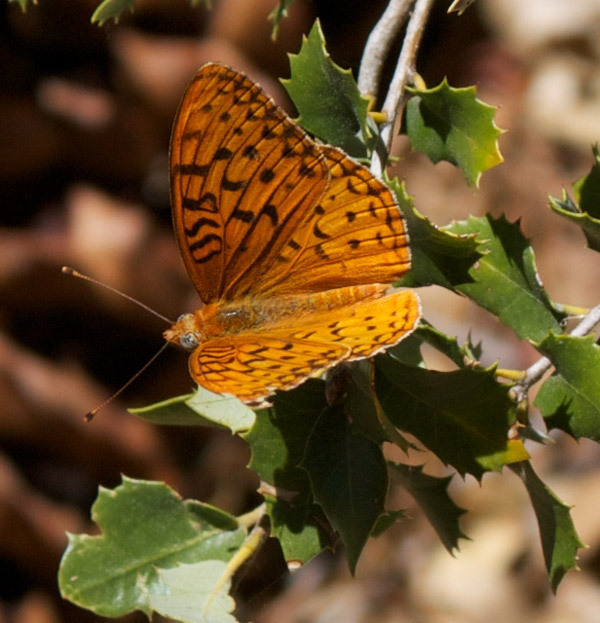 Coronis fritillary and Quercus chrysolepis. Photo by Laura Camp. Butterflies are the colorful heralds of summer, as welcome in our gardens as flowers on the wing. Nectar-bearing plants will bring butterflies, but all-around butterfly gardening means living with caterpillars, chewed leaves and some untidiness. 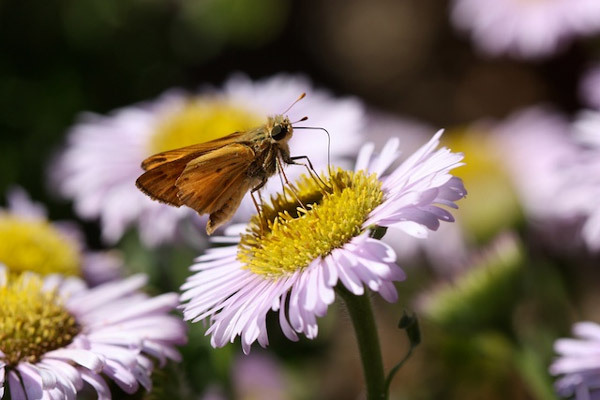 A butterfly garden should be sheltered from strong wind and feature larval food plants, nectar flowers and other foods for adult butterflies. Most butterflies feed on flower nectar, though a few have some rather surprising eating habits – more about that later. Being cold-blooded creatures, butterflies depend on the sun’s warmth for mobility. Hence, their nectar flowers tend to grow in full sun. 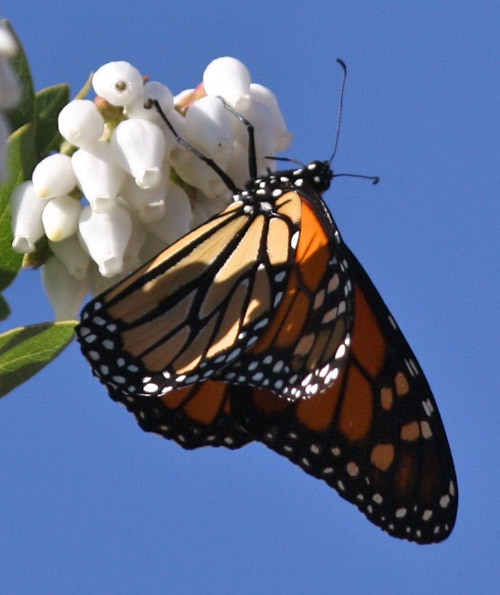 Good nectar plants often have clusters of small flowers, which lets the butterflies conserve energy by sampling many flowers in one small area. The sunflower family, Asteraceae, fills that bill nicely, since each daisy is really a group of many smaller flowers. Of the many native daisies, seaside daisy, Erigeron glaucus, yarrow (Achillea species), golden aster, Eriophyllum species, native pearly everlasting (Anaphalis margaritaceae), are just a few. Shrubby daisies like coyote brush, Baccharis pilularis and various Ericameria and Hazardia species provide shelter as well as nectar. Non-native, invasive thistles are often promoted as butterfly plants, but you can avoid the proliferation of weeds by planting well-behaved native thistles. The cobweb thistle, Cirsium occidentale is elegant and showy, and one of its several varieties may be native in your region. The knotweed family, Polygonaceae, includes wild buckwheats, from the coastal chalk buckwheat, Eriogononum latifolium, to the grand Saint Catherine’s lace, E. giganteum, from Santa Catalina Island and the mountain-dwelling sulfur flower, E. umbellatum. There are others, also showy and easy to grow. Tiny, white flowers in umbels are characteristic of the carrot family, Apiaceae, and big, bold Angelica species and cow parsnip, Heracleum maximum, can feed a lot of insects. Try Lomatium species, smaller, often yellow-flowered, if you are in their native range. These carroty plants will also host larvae of the anise swallowtail. The flowers of our sages, Salvia species, make fine nectar sources, as do those of coyote mint, Monardella villosa. Wild roses, being open, with accessible flower parts, can be utilized by nectaring butterflies, unlike the multi-petalled garden roses. Planting lots of the same plants in groups means butterflies needn’t travel as far, and keeps them in your garden longer. To return to those odd feeders among the butterflies, the mourning cloak prefers willow sap to nectar, and can be seen walking down willow trunks, head downward. The dainty red admiral’s foods of choice run to flowing tree sap, rotting fruit, and bird droppings. Willow sap or festering fruit are also eaten by anglewings, tortoiseshells and wood nymphs. The full-service butterfly garden should include willows (should we nick the trunks to induce sap flow? ), and plants with fruit that can be left to hang there and rot. Awkwardness ensues, as fermenting fruit can attract yellow jackets, and an alcohol buildup in the fruit could result in inebriated birds. It might be best to site the festered fruit section in a remote corner of the garden. Butterflies tend to be generalists when it comes to nectar feeding, but they are often specific about their larval host plants. Our three species of painted ladies may look similar, but are not identical in their preferred caterpillar foods. The American or Virginia lady uses pearly everlasting, Anaphalis margaritacea, and cudweeds, Gnaphalium and Pseudognaphalium species, and sagebrush, Artemisia species. The painted lady can eat plants in the mallow or pea families, but seems to favor thistles, which do double duty as nectar plants. The west coast lady’s larvae dine exclusively on mallows, like the shrubby Malacothamnus species or the herbaceous pink checkerbloom, Sidalcea malviflora. Butterflies that breed outside your region are unlikely to lay eggs in your backyard just because you grow their larval host plants. Fans of monarchs and pipevine swallowtails (aren’t we all?) take warning. If milkweeds, Asclepias species, are native where you live, you may well get monarch larvae, and milkweed flowers are also great for nectar. The pipevine, Aristolochia californica, will attract the iridescent-black pipevine swallowtail, if grown within its natural range. Both monarch and pipevine swallowtail caterpillars grow to be huge and picturesque, and are voracious eaters. Watching them devour their host plants is like feeding time at the zoo. Some butterfly larvae are even adapted to feed on the tough leaves of woody plants. The California sister, dark with white bands and orange upper wing corners, needs oaks for its larvae. They can also eat the closely related tanbark oak (Notholithocarpus densiflorus). Chinquapins, Chrysolepis species, are larval hosts for the golden hairstreak. Other host trees include alders, Alnus species, for the tiger swallowtail larvae. The pine white butterfly’s caterpillars feed on needles of pines and their kin, like Douglas-fir and true firs, while larvae of the western pine elfin eat needles of shore pine (Pinus contorta var. contorta). Wild lilac or blue blossom shrubs, Ceanothus species, may get the prize for most butterfly species hosted: Pale swallowtail, California tortoiseshell, hedgerow hairstreak, brown elfin, echo blue and spring azure all use it. The majestic ceanothus silk moth is as showy as a butterfly, and its host plants are wild lilac and coffeeberry, Frangula (formerly Rhamnus) species. There are more larval host plants than could possibly be listed here, but violets, Viola species and plants in the pea family, like lupines, Lupinus species, deserve special mention. Gardeners can also accommodate butterflies by providing large rocks in the sun for wing warming, a small water feature (or better yet, a permanent mud puddle) and an environment free of pesticides and herbicides. Don’t over-prune your plants, as you risk cutting away or exposing the chrysalides of metamorphosing butterflies. When choosing plants, be sure to include local genetic stock, as local butterflies are best adapted to local plants. Our gardens can never replace lost wild habitats, but maybe we can help in a small way to sustain our native butterflies, while surrounding ourselves with beauty. Monarch butterfly on Arctostaphylos refugioensis. Photo by Laura Camp.